The Reading Challenge Addict Challenge is simply a fun way to track the challenges you're already doing. The hosts will be giving away prizes, so you will want to check out the blog they've set up. Basically, all this challenge really involves is tracking the challenges for which you've signed up this year. Easy, right? Go check it out! 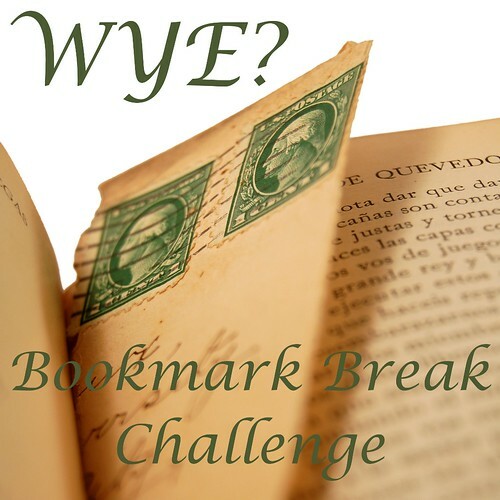 The Bookmark Break Challenge, hosted by AubrieAnne over at Who's Your Editor?, just involves reading more books than the host. If you beat her, she'll feature your blog on hers and post your button on her sidebar for a whole year. Clever and fun! I love it. Go sign up if you think you're up to it. Even if you're not, check out AubrieAnne's blog - I just discovered it and it's great. See, I told you, two more challenges that aren't really challenges at all. I'm not a reading challenge addict AT ALL. Hi Hogwarts Reading Challenge 2011 is now up and running until June 30th. This is the last Hogwarts Challenge for me as such it will be more involved and hopefully more fun. Click Mini Challenges for dates and info. I am not announcing any prizes other than the $15 gift card to a random winner for participating in the main challenge with the 5 book minimum met. However, there will be a drawing for a prize for all those who are able to accumulate 450 plus points and well as participate in all the mini challenges as well as read 7 books from one series (in honor of the 7 HP books). This final challenge is called the Triwizard Tournament. All prizes will be given out any time after the mini challenge or right the main challenge but if you win you will get your prize.